Accessible Parking is located near the main entrance to the amphitheater. A state issued handicap license tag or an ADA (Americans with Disabilities Act) hang tag placard must be displayed to access accessible parking. Accessible Seating is available at the top of the hill on a paved area with a railing. An ADA restroom is also available on the concourse level. 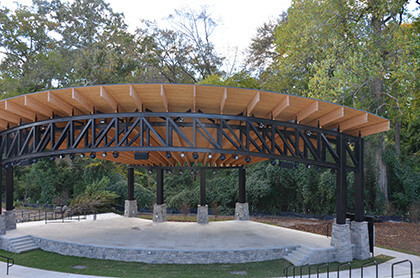 Icehouse Amphitheater is an outdoor venue. In the case of inclement weather cancellation or delay of an event will be made by event management. All efforts will be made to ensure an event can continue, however safety will always be our first priority. Refunds will be handled on a show by show bases. For the most up to date information check our Facebook page. There is a small number of parking spots available in the parking lot adjacent to the amphitheater. After 5PM parking is also available in Town Hall parking lot off Maiden Lane, and after 6PM in the Lexington County Court buildings. Please be courteous to local businesses’ private parking lots and use public lots. Smoking, including vaping and E cigarettes, is not permitted inside the gates of the amphitheater, and within 50 feet of the entrance gates. This includes all seating areas and concourse areas. All bags must be 8”x12”x12” or smaller. All persons and bags are subject to search by event personnel. There is no re-entry for ticketed events. Umbrellas are not allowed in the amphitheater. Aerosol cans, alcoholic beverages, cameras with removable lenses, coolers, picnic baskets, fireworks, illegal drugs, laser pens and pointers, noisemaking devices, outside food and beverage, video or recording devices, weapons and any other items deemed inappropriate or dangerous by the Icehouse Management are prohibited. All event attendees and staff will be asked to leave if they violate these rules. Blankets are always welcome for seating purposes only. Lawn chairs will be permitted on an event by event basis, please check the event page on the web site for lawn chair policy. Pets are not allowed in the amphitheater. Service animals are permitted when escorting guests or staff with disabilities. 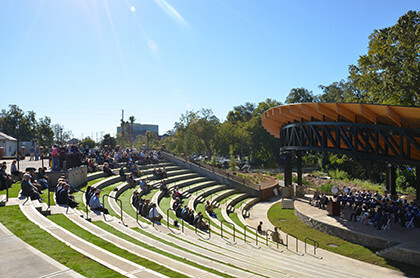 Cameras without a detachable lens, digital and disposable cameras are permitted at the amphitheater unless otherwise noted for a specific event. There is no audio or video recording allowed in the amphitheater. Tailgating is generally permitted. However, open alcoholic beverages are not permitted in the parking lots. Due to risk of fire, open flame fires and charcoal, and gas grills are prohibited.